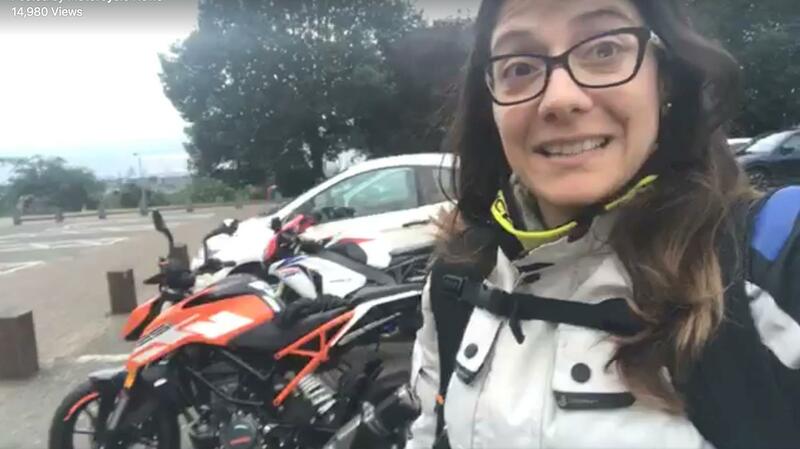 ﻿ MCN Fleet: "The 125 Duke was made for the city"
Maria at Alexandra Palace with her 125 Duke. So I braved the A1 (M) again, but this time down south to London. With a full tank under my belt and a slight fear I wouldn't be able to hack the hustle and bustle of our big capital, I arrived at the Hatfield tunnel. The smell of fumes momentarily took over and before I knew it I was in the thick of London’s traffic. Unsure and constantly checking whether I can use the bus lane, being overtaken by several scooters who are nipping in and out of traffic, standing out as a complete newbie, I finally make it to Alexandra Palace. My absolute favourite place to be in London. E—l—a—t—e—d to have arrived with Doris the Duke in one piece, we do an MCN Facebook Live and tell the world how unbelievably proud the 125 Duke has made us. This bike was made for the city; it feels light, nippy and a breath of fresh air to be with. Born and bred in London, I know the city well. So although I had a shakey start when filtering, I soon nipped to the front of the queue at traffic lights. Setting off at the lights is fun. It's a smooth acceleration from first to second gear and I'm able to get out of the way before potentially being rammed by an impatient city driver behind. The brightly-coloured Duke stands out when pushing past traffic so that helps to keep you visible and as you're never going over 50mph the power is more than enough. I don’t want to leave, but sadly, back on the A1 (M) we go. Ready once again to struggle with the slopes of the motorway that slow us down massively. Seriously, am I mad to keep using my 125 on the motorway? Segura ladies jacket - So soft and comfortable from new, bit pricey but warm and worth it. Drayko Racing jeans - I got them a size up thinking they'd be a bit too tight but they're massive for me, so now I wear them with a belt.